Prepare thyselves. Soon a haze will descend on our fair town. 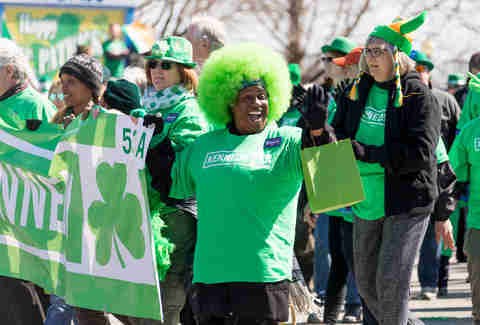 Throngs of green-wearing revelers will take to the streets. The sweet scent of fine draft stouts will fill the air. The rivers will run green with… well… green dye. What we’re trying to say is St. Patrick’s Day is coming. Specifically, it’s coming for you. Whether you like it or not. We’re here to make sure you’re prepared, and that means giving you a survival guide to one of Chicago’s most iconic events: the annual St. Patrick’s Day Parade. 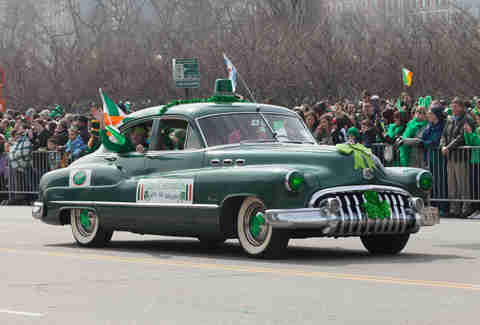 What time does the 2019 Chicago St. Patrick’s Day parade start and what is the route? 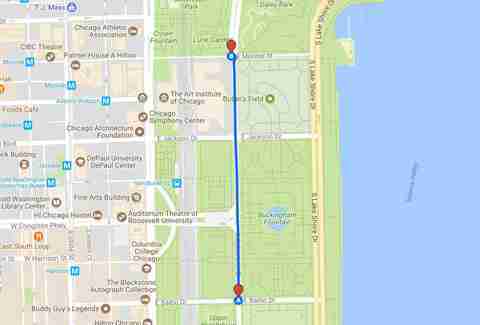 This year, the parade will kick off on Saturday, March 16, at noon sharp, beginning at the corner of Balbo and Columbus, heading north to Monroe street. They’ve set up a viewing gallery right by Buckingham Fountain, so be sure to head there to stake out a spot. 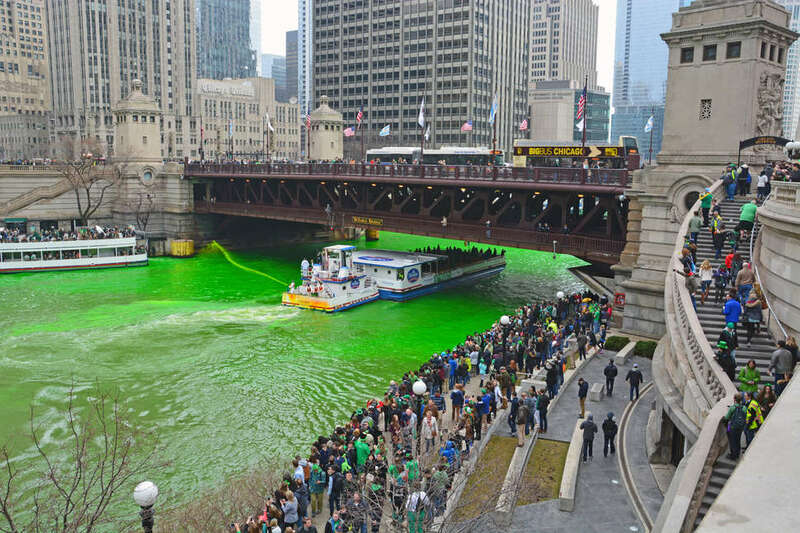 Speaking of staking out a spot, if you want the full Chicago St. Patrick’s Day parade experience, you’ll want to catch they dyeing of the Chicago River as well. As of now, the dyeing is scheduled for 9am the morning of the parade. Recommending viewing spots include the riverwalk between Michigan and Columbus, the west side of Columbus, and all along Lower and Upper Wacker Drive between Michigan and Columbus. We highly recommend arriving at least a half hour early to carve yourself out a viewing spot. As an added bonus, all these spots are steps from the Buckingham Fountain, so you can just hop over there once the dyeing is done! For more essential info, the official website has a bunch of FAQs covered, as well as VIP tickets for grandstand seating. What will the weather be like, and what should I wear? According to Accuweather.com, the weather for this year’s parade will be a positively balmy-for-a-March-day-in-Chicago 43 degrees, with a low of 29. Currently, nobody’s calling for rain, so there’s nothing stopping you from having a friend apply a thin coat of green plasti-dip to your entire body. Well, nothing but common decency, your own self-preservation instincts, and about 43 local and state laws. Since you’ll be outdoors for the majority of the day, though, you’ll want to layer up. You probably already have a favorite green top, pair of pants, and set of sequined suspenders, but if you want to accessorize, consider stopping by Celtica Gifts! Not only do they have a whole bunch of amazing Irish jewelry and gifts, they also have a ton of specialty foods that’ll make you nostalgic for Ireland even if you’ve never been there. If you really want to go the extra mile, though, get your hair done at Bentley Hair and Beauty before the festivities. They’re an Irish-owned business, and they’re offering temporary streaks of festive silver-and-green color specifically for the holiday (as well as 10% off all of their services). What else is going on over the St. Patrick’s Day weekend? The nice thing about the parade being where it is is that you literally won’t be able to walk a block without finding a bar hawking Guinness and corned beef sandwiches. That said, if you’re looking for something more authentic than dyed-green Old Style, head over to the Irish-American Heritage Center for their annual St. Patrick’s Day Festival. It’ll feature traditional Irish dancing, Irish gifts, and (of course) plenty of Irish food and drink. If you’re trying to stay downtown, though, we recommend spending the day at Raised, the only rooftop bar in Chicago that’ll have a view of the dyeing of the river. They’ve got a full-on St. Patrick’s Day bash set to kick off at 8am, and lest you think that’s too early, your ticket will include green mimosas, bloody marys, chicken and waffles, and tons more St. Patrick’s Day-appropriate food and drink. Geja’s Cafe is also getting in on the fun with a St. Patrick’s Day-themed four-course prix fixe menu, featuring their signature fondue as well as corned beef and potatoes, finishing with plenty of mouth-watering chocolate fondue. Listen, you’re now as prepared as you’ll ever be. The only thing left to do is fill your pocket with mousetraps to use against anybody who dares attempt to pinch you. Good luck, and godspeed.